If you’re starting a new YouTube channel or looking to bump up the production value of an existing one, one of the easiest ways to do so is by buying proper lighting equipment! Don’t understand the listed features or technical mumbo jumbo? At the bottom of our list, we’ve also included a section explaining what these deciding factors mean, and why they are important to consider when purchasing a Ring Light. 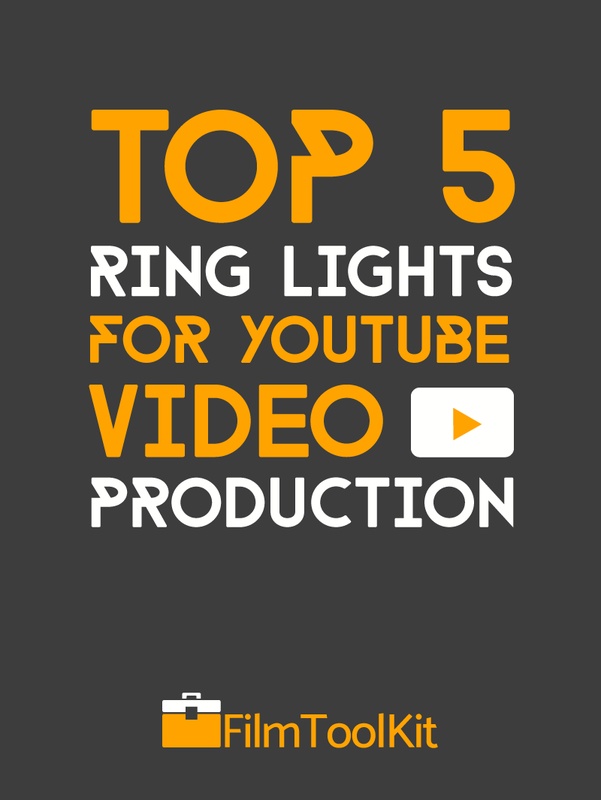 So, without further ado, we present FilmToolKit’s Top 5 Best Ring Lights for YouTube Video Production! 1 Why Should You Buy a Ring Light? 4 How Do We Determine The Best Ring Light? Why Should You Buy a Ring Light? The price point is very affordable, floating between $100 and $300 USD. At Vlogger and makeup conventions, it is not uncommon to see nearly every table fitted with one of these lights. They light your face in a very flattering way, removing emphasis on zits and wrinkles. They originally were marketed towards professional photographers. However, in recent years with the expansion of beauty and make-up vlogs, they have become a staple in any guru’s toolkit. They’ve been endorsed by tons of beauty YouTubers, and even big name celebrities like the Kardashians. The Diva Ring Light Super Nova 18″ inch costs a little bit more money, but is definitely worth the premium. The Nova and SuperNova lights are so popular, that there are large communities of content creators that simply call their lights “Diva Lights”, even if they are made by other companies. This is the most popular ring light in the world, and for good reason. The powerful 500W ring dims down to 20% of the full power with its 5500K daylight bulb. Although it may not have as many accessories as other ring lights on our list, it has all the essentials. This includes a diffusion cloth, multiple mounts, and a light stand. It doesn’t come with a smartphone mount or color filters, so if you need either of those you might be better off looking at the other options in our list. So why is this light number one if it doesn’t even have the most accessories? One word, reliability. Out of all the lights we looked at, this light had the highest percentage of positive reviews, with the smallest percentage of negative experiences. Unlike a few other ring lights on our list, the Diva light is backed by a 1-year manufacturers warranty. That way, if you are unfortunate enough to be in the 5% of people who have issues or receive a defective unit, you can always get another replacement free of charge! The bulb is fluorescent, so it runs cooler and can remain on for several hours at a time. Fluorescent bulbs vs LEDs are discussed in greater detail later. Our Verdict: A little more expensive, but you get what you pay for, and there is no way you will regret your purchase. If you are interested in the Diva Ring Super Nova, but don’t want to drop almost $300, there is a lower tier version just called the “Nova”. The Diva Ring Nova is priced around $50 USD lower, and retains all the same functionality except it is not dimmable. If you have materials that can dim your light for you, then this is a great way to get the best product while also saving money. This Ring Light might not be our number one pick, but it is the number one pick on Amazon! While not as strongly reviewed as the Nova or SuperNova by Diva, the Neewer comes in at an excellent price point, has multiple size options, and comes with the most accessories out of all of the Ring Lights we have reviewed. It includes a tripod head, bluetooth receiver, smart phone holder, white and orange color filters, a light stand, and a soft tube. Rather than the Fluorescent bulb of the Diva ring, the Neewer Ring Light features LEDs. 180 on the 14 inch model and 240 on the 18 inch model. In terms of reviews, many are extremely satisfied, but there are significantly more 4 star reviews compared to a product like the Diva ring. These 4 star reviews seem to cite two common issues, the lack of an instruction manual, and low build quality on the bluetooth clicker. Seeing as none of our other lights even offer a wireless clicker, this should be a non issue. So, if you think you can figure out how to set one of these bad boys up (I mean look at the parts in the picture how hard could it be?) this should definitely be your light of choice. Although the build quality is not as strong as the Diva, it is still very strong. This ring light is the best choice for you if you want to get the most value for your money. P.S. This is also the best option for you if you are creating your content with a smartphone! The only light that outranks this one is the Diva, which does not include a smartphone holder. Our Verdict: The best bang for your buck ring light. Reliable, comes with tons of accessories, and most importantly, It’s really cheap for the quality you’re getting. The QIAYA Ring Light is the cheapest ring light on this list, around $100 dollars at the time of posting. It appears that both the 14 and 18 inch are powered by 180 LEDs at the perfect 5500K color. Fully dimmable 0-100% of course. It comes in two models, 14 inch and 18 inch, with only around a $20 price differential between them. This light earns a spot on our list because it comes with a 12 month warranty. This means that even though it’s cheap, you can always get it replaced if it craps out on you! Even though it’s one of the cheapest ring lights on the market, user experience seems to be solid. A few users on Amazon cited malfunctions with their lights. These same users went on to say they had a very positive experience with QIAYA customer service, and had their problems solved quickly. There is one aspect of this product that could be either a big plus, or a downside. It doesn’t come with a stand. It comes with a travel kit, phone and camera holder, and just about every mounting adapter you could need, but no stand. This means that if you already have a stand or tripod, this is the cheapest solution for you. However, if you are lacking a stand, you might want to look into another option on this list. Our Verdict: The cheapest ring light. The best ring light at the cheapest price. Great customer service. Reliable 12 month warranty. Eachshot has much less brand power than brands like Diva or Neewer. However, the company has put together a competitively priced reliable ring light in both 14 and 18 inch sizes. Just like the Neewer Ring Lights, it utilizes 180 and 240 LED’s respectively. The light is fully dimmable from a range of 1-100%.. Wait. All of this sounds pretty familiar. Yes, this light is almost identical to the Neewer Ring Light. It actually fluctuates in price sometimes to be cheaper or more expensive than the Neweer light. As you can see it comes with almost all the same accessories, including the color temperature filters. Reviews are solid, and actually a little bit better than Neweer’s in some occasions. However, this is drawing from a sample size around half as large, so your mileage may vary. Many users have praised the strength and the affordability of this ring light. Unlike many of the other ring lights on our list, when we examined the one star reviews, none of them discussed light failure. The main issue users seem to have been encountering is broken or missing stands. This accounts for a very small fraction of customers, and shouldn’t scare you away from buying. The company website also states it has a 30 day refund guarantee. So you should be able to purchase an Eachshot ring light with peace of mind. Our Verdict: Not as much brand power as Neweer, but a seemingly identical product. If the price is right, the Eachshot ES240 is a solid ring light. The LimoStudio 18″ ring light is the middle ground of all of our picks, falling right in the center of the price range. It differs from the rest of our choices as it utilizes a fluorescent light compared to LEDs. (We describe what difference this makes at the bottom of this post). However, it is still fully dimmable, and comes with a light stand, mounting screws, a light diffuser cover, and even a carrying case! The reason why this light is at the bottom of our list is because there have been some complaints about the accessories. A few customers have complained that the light diffuser was too small for the light. A few others have complained about issues with their lights after just a few months. There are dozens of other reviews praising the light and how beautiful it is. So take the complaints with a grain of salt. Our advice? If you can get it for a good deal, there seem to be a lot of satisfied customers. Otherwise, your money might be spent better elsewhere, either on the Qiaya which is much cheaper and less of a loss in case of malfunctions, or spring for the more expensive Diva Ring Light so you can have a high quality product with good customer service. Our Verdict: It’s a solid pick. But there are better options out there. If you find this one on sale somewhere go for it. These Ring Lights are priced much differently than the others on our list. If your budget is around or under $30, you can’t go wrong with these. These small ring lights attach to your phone or camera lens. They are great if you’re a vlogger on the go, don’t have as much money to spend, or don’t want to invest in a full production studio. This Ring Light is our pocket pick. Like, it fits in your pocket. Hahahaha. Maybe you don’t have a fancy pants DSLR or Camcorder! Maybe you record your YouTube videos on your iPhone. There’s no reason why you can’t still take your content creation to the next level! This rechargeable portable ring light clips right onto your phone and features 36 LEDs with 3 Dim settings. It weighs only 2.5 ounces, fits in your pocket, and has a universal clamp design that allows it to clip on any phone, tablet, or laptop. Buyers appear to be very happy with its performance. It lasts over 5 hours, and is great for vlogging on a phone or taking selfies with your front facing camera without losing flash capabilities. It is very bright, USB charged, and comes well packaged. There are a few complaints that it may just make your footage blurry or leave a weird glow if you have a lower quality smartphone. These complaints seem to be few and far between, but if you are a serious content creator, we’d suggest spending more than $15 dollars on your ring light. However, if you’re on a tight budget, casually vlogging on your phone, or want to step up your selfie game, there could not be a more perfect option. If you’re looking for something on the cheaper side, or something more portable for a DSLR, this is the choice for you. With 3 dimming settings, this light comes with 6 different adapters so that it can attach to almost any SLR lens. This means you don’t have to worry about it being compatible with your camera. It’s powered by AA Batteries, and has been recorded at lasting around 6 hours on a full charge. Reviews for this product are decent, but as it is usually priced around $30, you get what you pay for. Users have noted that it gets the job done for close-up macro photography. However, other users have said that the build quality leaves something to be desired, and there are a few defective cases here and there. If you are okay with those few compromises for a cheap solution, this ring light is definitely better than nothing! How Do We Determine The Best Ring Light? The following list describes the factors taken into consideration to rank these ring lights. While these are all important to consider, our rankings are more influenced by aggregating user reviews. After all, what good does 10,000 LED’s do you if your gear breaks down on the second day of usage? There are many different types of light bulbs, but when you’re in the market for a ring light, you’re likely going to be dealing with either a Fluorescent Bulb, or LED Bulbs. There are a few key differences you may need to consider. LED lights are more durable and energy efficient. Fluorescent bulbs are more diffused, and are generally cheaper. The differences are marginal however. Fluorescent bulbs may add a bit of a green tint to your subject, requiring some color correction, but LEDs may add a pinkish tone as well. Because most of the options we have presented feature LED bulbs, it is probably more important that you consider the amount. Less bulbs may be cheaper and more energy efficient. However, it is our opinion that it’s better to have too many bulbs than too little. You can always use your dimming or diffusing accessories to adjust if your light is too bright, but if your ring light can’t get bright enough, you’ll wish you had more. The color temperature of the bulbs used is an important factor to consider when purchasing a light. Color Temperature is basically a number expressed in Kelvin typically ranging between 1000-10000, indicating what color of light is emitted. Lower numbers represent warmer orange-ish hues, while higher numbers represent bluish light. Typically you want to adjust your camera’s white balance so that you have a neutral image, which can be easily manipulated in post. But you may want a slightly warmer or colder picture based on personal preference. All the lights that we have recommended in our buyer’s guide are 5500k lights, which is a neutral white simulating daylight. In addition to adjusting your camera settings, a few of our recommendations also come with color filters that can help you change your color temperature. Different ring lights also may feature light settings or dim functionality. As mentioned earlier in the light type section, the option to dim your light is great because you wont have to be under or over exposed. However, dimming can also be achieved with cheap fixes like filters, so if you don’t think you need it, passing on the dimmability can be a smart move for your wallet. Each lighting kit may or may not come with Accessories. These can include color temperature filters, bluetooth receivers, adapters and stands. Some lights will only contain the light, and you’ll be on your own for the rest of your lighting setup. We consider this factor to have less weight in comparison to others, as accessories can always be purchased after the fact and still come out cheaper. More important than that is the ease of use. The target demographic for Ring Lights is YouTubers that need a quick, simple solution to their dimly lit videos. Often times if you’re buying a Ring Light you want to be able to just plug it in and get to work. Complicated setup or assembly is definitely an important factor, and if users are reporting poor or missing instructions, that’s something you need to know.